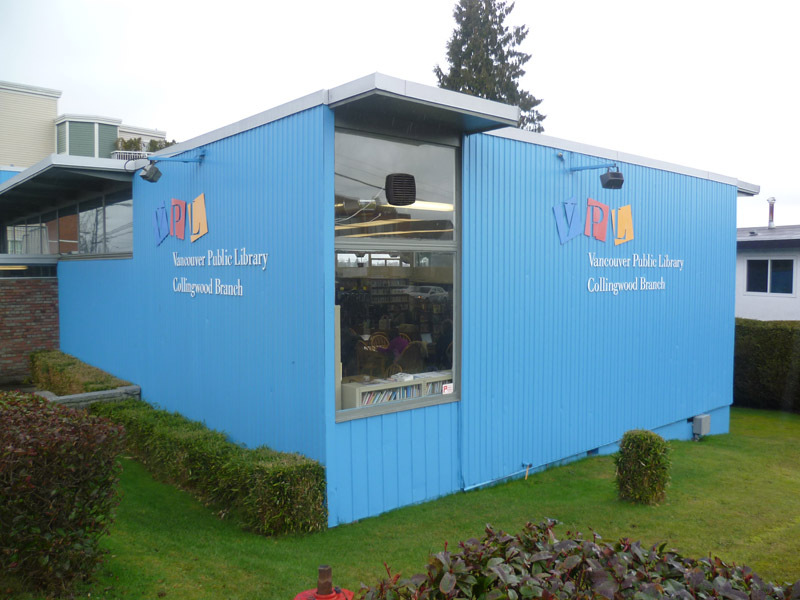 This is the library closest to where I live, yet I never actually go to it. I'm sure there's nothing wrong with it, it's just that it's far enough away from my house that I won't stop in there on my way somewhere. I've gotten some graphic novels out from here, but I'm not even sure what they were. Pretty much all I can remember is that it's blue and kind of small. So instead I'll give you some links to other library related things! The VPL Branch Project: A couple of years ago a high school student in Vancouver had the exact same idea as me and visited every branch of the VPL. (I guess it shows how unhip I am that I made my version a blog instead of a tumblr. Oh well.) 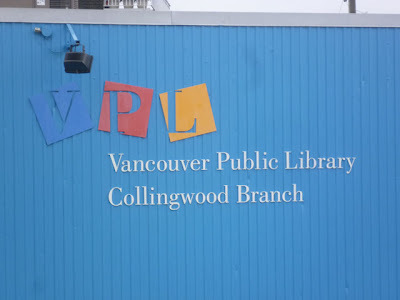 She had more to say about the Collingwood Branch than I did, though didn't rate it that highly. Oh, and she brought a sock monkey along with her to every branch, so her photos are probably more interesting than mine. Two Fisted Librarians: Not content with this blog, my other blogs, and all that schoolwork I should be doing (why I haven't updated this site as much as I should have), I've started another project! This one is a pulp fiction anthology zine featuring stories about mad science, weird fantasy, occult horror, spicy mysteries, noirish romances, thrilling adventures, and whatever else (as long as it's library themed!). There's more info on the blog if you're interested, but the deadline for submissions is April 30th, 2013, so get writing! When I was in grade 6, I interviewed the librarian there, her name was Janet, about what it was like to be a librarian. I wish I'd kept that project!